These ladies were on their way to a Seaport Wedding and they had great photographers with them! 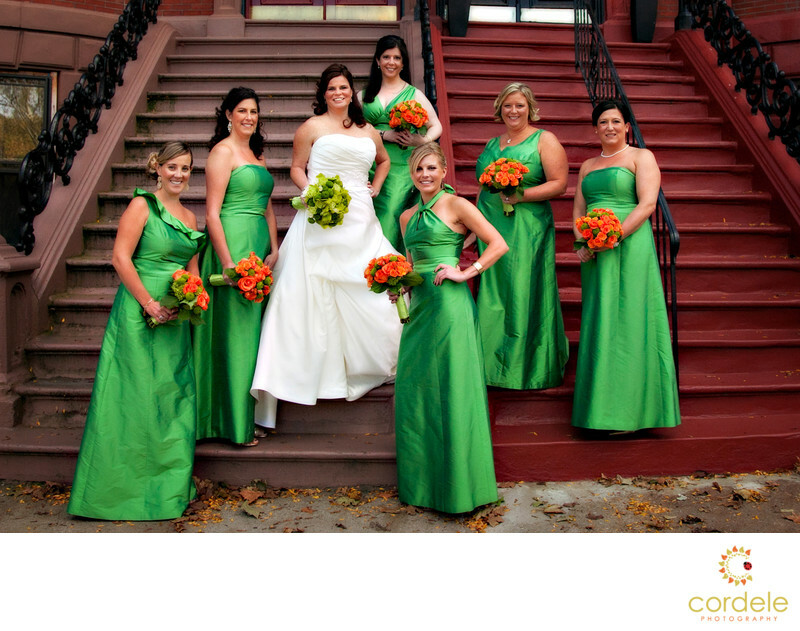 They were asked to stand on the stairs in Boston for a fall themed wedding while wearing green dresses. Fall weddings in New England are such a wonderful event! The colors you have to work with along side the contrasting flowers. Erin was married at the Seaport Hotel in Boston MA. She wanted to drive over to her apartment from the Seaport to do a few shots in the area. When we ended up in horrible Boston traffic, we ended up pulling over and walking a few blocks to get to her apartment. It was a great walk because we were able to stop at lots of great locations in South Boston for photos. She had such a great bridal party that we were able to stop every couple feet and do something different. When we saw these multi colored stairs we knew we had to do something. I didn't want the standard cookie cutter shot of them in a line. I knew Erin wanted Modern Photography to go with her modern venue. She had a October Wedding so the colors of the stairs with the girls dresses and the flowers just worked. I loved how Erin's flowers off set against her white dress. Linking her up to the bridesmaids with just a hint of green. It was a cool fall day in downtown Boston and Erin was SO excited to have it not be 90 and hot! Wearing that heavy dress really would have done her in! When we got to her apartment in South Boston we were able to go up to her roof deck and take some Boston Skyline photos that were just amazing! I am so glad we were able to do that!